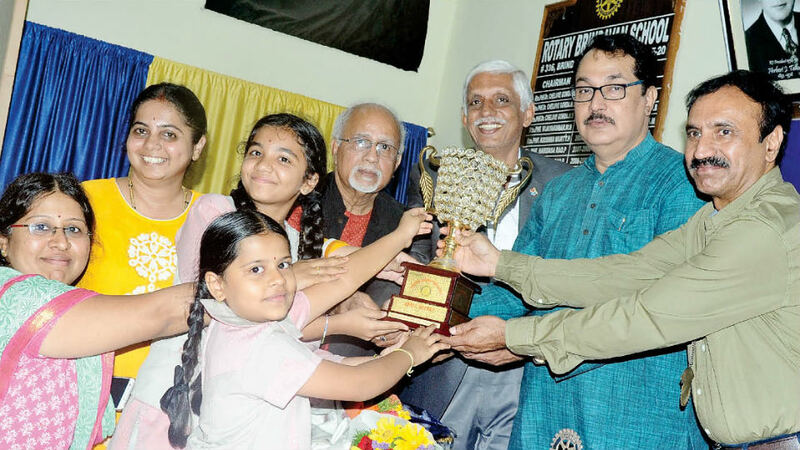 RAAGA ROTARY Vocal Music competition was conducted in city recently by Rotary Mysore Brindavan. More than 280 students from 40 schools participated in this contest. Picture shows Pramati Hillview Academy team receiving the “Manjunatha Hebsur Rolling Shield” from chief guest PDG Rtn. M. Lakshminarayan as Club President Rtn. K. Prakash, Assistant Governor Zone 8 of RI Dist. 3181 Rtn. P.V. Ramdas and RAAGA ROTARY Chairman, Zonal Lieutenant Rtn. K.S. Raghavendra look on.